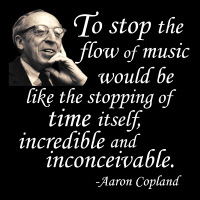 Composer Aaron Copland’s observation will resonate with musicians and non-musicians alike, because who is there among us who can imagine a world without music? Now you can own this timeless quote (or give it away to your favorite musician or music lover) on many t-shirts and other apparel and merchandise options, as shown below! Buy it now on a t-shirt, hoodie, mug, tote bag or other quality gift or apparel item. Choose something for your favorite musician, music teacher or student, exclusively from GearGems!